Move over Alnwick and Haltwhistle — another location in Northeast England holds artifacts from RMS Olympic, sister-ship of the ill-fated RMS Titanic. While many ocean-liner enthusiasts know about the Olympic fittings at the White Swan Hotel in Alnwick and the Crown Berger paint works in Haltwhistle, few are aware that the Lambton Hounds Inn and pub, located in the small village of Pity Me just north of Durham, houses the ship’s cocktail bar. The Lambton Hounds is a 250-year-old coaching inn on the Great North Road between York and Newcastle. With a congenial atmosphere and inviting fireplace, it is a popular local and features a lounge, snug and restaurant. A wide selection of both keg and cask-conditioned beers are on offer, including Caledonian’s Deuchars IPA, an award-winning session beer. The Olympic cocktail bar is located in the pub’s current lounge bar. According to Ian, the pub’s cellar master, the bar was installed during recent renovations to the Lambton Hounds. 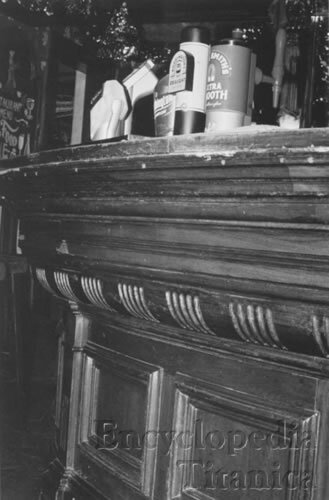 The bar had been stored at Sunderland’s Vaux Breweries Ltd. After that brewery went out of business in July 1999, it came to light and was installed in the Lambton Hounds. Vaux, a brewery dating from 1806, had originally repossessed the bar after a publican failed to pay his debts. Only the outside of the bar is original. It has a new top, and most of the inside has been sealed off, although Ian said the inside still shows the number 400, Olympic‘s hull number while under construction at Belfast, Ireland’s Harland and Wolff shipyards. 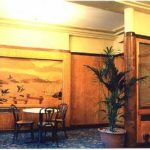 The Lambton Hounds pub also displays a brass plaque informing patrons of the lounge bar’s provenance and other Olympic and Titanic memorabilia. The cocktail bar at Pity Me is only one of Northeast England’s links to Olympic and Titanic. Olympic was initially dismantled at Tyneside’s Palmers shipyard in Jarrow in 1935 before final scrapping two years later at Inverkeithing in Scotland. There was an auction of items from Olympic on 6 November 1935 and this was when the hotel and Crown Berger acquired their fittings. A prime article for a pub to purchase at that time would obviously have been a cocktail bar. The Smoking Room walls are panelled with the finest mahogany, carved in the taste of our Georgian forefathers, and relieved everywhere with inlaid work in mother-o’pearl. Here, seated around the home-like fire, we may enjoy Mr. Norman Wilkinson’s fine painting of the Approach to the New World, and meanwhile smoke and drink as wisely and well as we feel inclined. 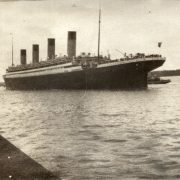 There are also Titanic connections with the area. Titanic victim William T. Stead, the British journalist, reformer and spiritualist, was the former editor of Darlington’s Northern Echo daily newspaper. The Cunard Line’s RMS Carpathia, the ship that rescued Titanic survivors, was built at the Swan, Hunter & Wigham Richardson shipyard at Wallsend-on-Tyne in 1902. 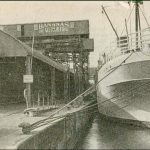 The company’s crack transatlantic express liner RMS Mauretania was also built at Swan Hunter. 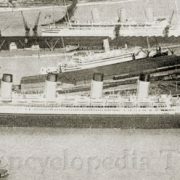 The success of Mauretania and its sister-ship RMS Lusitania prompted the White Star Line to plan the Olympic-class liners in 1907 as competition for Cunard. Charles Parsons built Turbinia, currently on display at Newcastle’s Discovery Museum, on Tyneside. Turbinia was the first ship to effectively employ steam turbine engines in 1897, the same form of propulsion later used in Mauretania and Lusitania. The Olympic-class vessels used the more-conventional (and slower) reciprocating engines. For those wanting to view the Olympic cocktail bar, the Lambton Hounds is located at 62 Front Street (off the A167). It can be reached by telephone on (0191) 386 4742 or fax on (0191) 375 0805. The pub is listed in the Campaign For Real Ale’s Good Beer Guide. The Lambton Hounds cannot be missed, as it is the only pub in Pity Me. While there, have a glass of Snakebite, a favourite local drink of half lager and half cider. But be forewarned, it packs an Olympic punch!